The Cistus & Halimium Website – All photographs and text on this website are copyright. Use without permission is strictly forbidden. of Robert G. (“Bob”) Page Rawdon, Leeds, West Yorkshire, England. This website aims to give you information about my collection and the plants themselves. It is intended not only to provide basic information for the interested amateur but also to provide material for the more serious researcher. I hope that you will be able easily to find the information you want and that you will share some of my enthusiasm and passion for these beautiful and interesting shrubs. If you do not find what you are looking for, please email me. My collection has been built up over thirty years. It was registered with NCCPG and given National Collection status in 1991. In 1999 it was promoted to Scientific Status. It was nominated for the Brickell Award in both 2003 and 2004. I withdrew the collection from NCCPG in 2004. 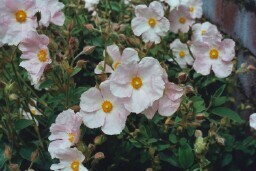 The first National Collection of Cistus was established by Duncan Donald at Chelsea Physic Garden in London and developed by Fiona Crumley. I worked closely with Chelsea in a mutually supportive and very fruitful collaboration. The collection at Chelsea was withdrawn, but most of the living collection was saved and used to supplement another private collection in very capable hands. My collection includes wild-collected species and natural hybrids, man-made hybrids and garden cultivars, including many I have bred myself. I do not have the space to produce plants for sale, but I am glad to supply cuttings and welcome enquiries from nurseries interested in acquiring new or superior cultivars for sale. I have contacts with fellow Cistus &Halimium enthusiasts in several countries, especially France, and welcome new contacts with fellow enthusiasts. This article proposes the inclusion within Cistus L. of Halimium (Dunal) Spach and therefore also of x Halimiocistus with major consequences for nomenclature. Except where credited, the photographs are my own amateur work. More photographs can be found in the publications referred to on the my own published works page. The photographs and text on this website are copyright. Permission must be sought before any use is made of my photographs or text. The collection is in my private garden and I do not have public open days. Visitors would normally be welcome by prior arrangement only. Please telephone or email well in advance. Morning is the best time to visit, as each day’s flowers usually drop their petals by late afternoon. The best time is usually late June/early July, but varies from year to year.